Hey, it's time for another rubber stamping project! I got to go the local Daiso recently and bought a few craft items that I didn't know I needed. Like adhesive cork sheets. 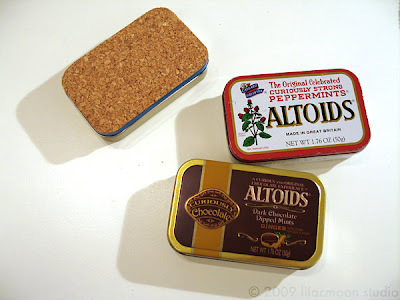 Here is how I used them on some Altoid tins I've been using to store office supplies. I first saw this idea long time ago on Daily Danny here but never got around to buying cork sheets. And there they were at Daiso for just $1.50! It's really simple. 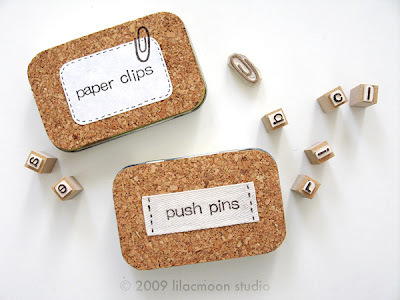 You just trace the shape of the tin on cork sheet with a pencil, cut and then paste on top of the lid. I wanted to do a little more decorating than how Danny did, so I made some labels, instead of rubber stamping directly on top. For "paper clips", I used a blank address label and for "push pins", I used a piece of twill tape that was rubber stamped first. This time, I made sure to try the VersaCraft stamp pads I mentioned before because they work for both paper and fabric. PS: Anyone interested in hand carving rubber stamps should see Geninne's tutorials here.